Stunningly beautiful Maasai Wedding Necklaces. These fascinating, multicoloured pieces of jewellery come from the Maasai tribe of Kenya. Comprising of a series of metal rings intricately decorated with glass beads of many colours which include red, green, blue, yellow, orange and white make up these wonderful adornments for a Massai bride. These are a set of 6 Maasai beaded wedding necklaces. There are three hanging bead adornments, red, blue and clear, the clear adornment has lost most of the beads, this can be seen clearly in the photos. The graphic quality and colourfulness of Maasai beadwork jewellery are well illustrated by the disc-shaped necklaces. Although the shape seems reminiscent of geometric construction, in the eyes of the Maasai they symbolize the patterns of life, reflect the universe which is thought of as having a circular form, while white stands for cows’ milk the blue for the sky. The beaded jewellery is a good example of the way African societies appropriate foreign elements and make them their own. Today it is seen as a traditional feature of the Maasai, yet most of the glass beads are made in Europe. When the Maasai gained access to such imported goods at the end of the 19th century, beads soon replaced the heavy metal ornaments that had been made up till then by neighbouring smiths. The colour, shape and size of the beads, as well as the pattern and technique of the finished object, were an indication of the ethnic origin of the maker, although there have been changes in fashions within the society. The Maasai preferred small round beads Bohemia in colours such as white, blue, red, green and orange. Various patterns were created using these basic colours, each being given a different emphasis. Care is taken not to place certain colours next to each other, such as red and orange or dark blue and black. The larger of the necklaces are called norkiteng ” the bull “ because a family had to sell a bull in order to obtain enough beads to make it – and among the Maasai who were/are traditional cattle keepers, these animals were sold only on important occasions. Being made by the female members of the community from beads brought by the parents of the bride for this purpose. Working closely together, the women select patterns which to the schooled eye reveal which of the sixteen Maasai sections the bride comes from. In addition, each new generation has to invent its own pattern, for Maasai traditions are living traditions. On her wedding day, the bride, is usually a girl aged between ten and sixteen years, wears this set of beaded jewellery when she leaves her home to go to that of her husband many necklaces being worn in a particular order. 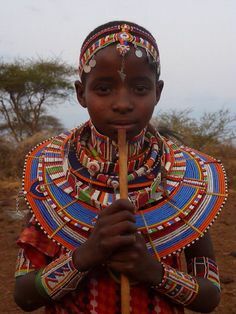 In the western world, Maasai women and warriors wearing colourful beaded jewellery are seen as symbols of an Africa that is primitive, exotic and also proud.